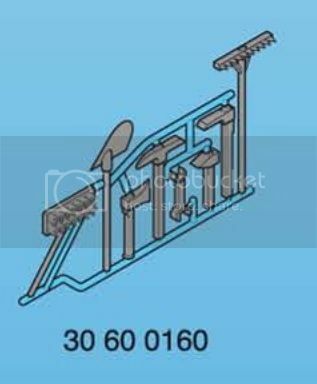 I bought this sprue of tools recently. In this view you can see why the shovel doesn't really fit. The reason I thought it must be a shovel that is missing is because eight grey tools are often found together in early PM sets and that eight includes a shovel. The sprue is not flat at the point where I have put the shovel, but has a piece much higher than the plane which most of the other tools lie in, as well as a large space to the right of where I put the shovel. (I dont think the sprue is significantly distorted and none of the shovels I have seem to have sprue attachment points in the right places. So, any other sugestions as to what the missing tool might be? (It's not the handles and frame of a wheelbarrow, I tried that)? uhm.. probably not the scythe either, right? 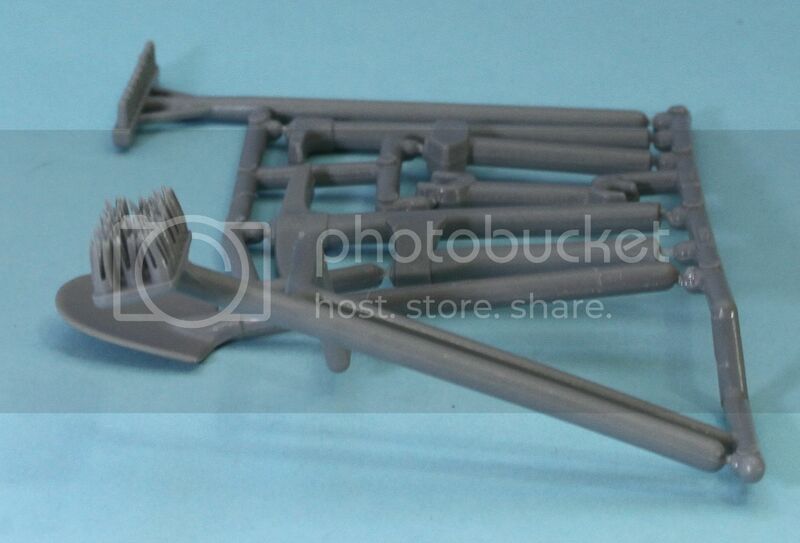 Yeah I think the scythe, with the blade down inside the sprue maybe? The scythe is a good suggestion, but it doesn't fit my sprue and I'm pretty sure it never came in that shade of grey. I'm wondering about something like part of a vehicle, a storage box for a fire engine perhaps? The tools would fit with that. No really fire engine tools, Graham, more construction or farming and I can't recall a fire engine with a grey toolbox on a sprue. I found it, in set 3472, here (Klickywelt, so membership required to view ). 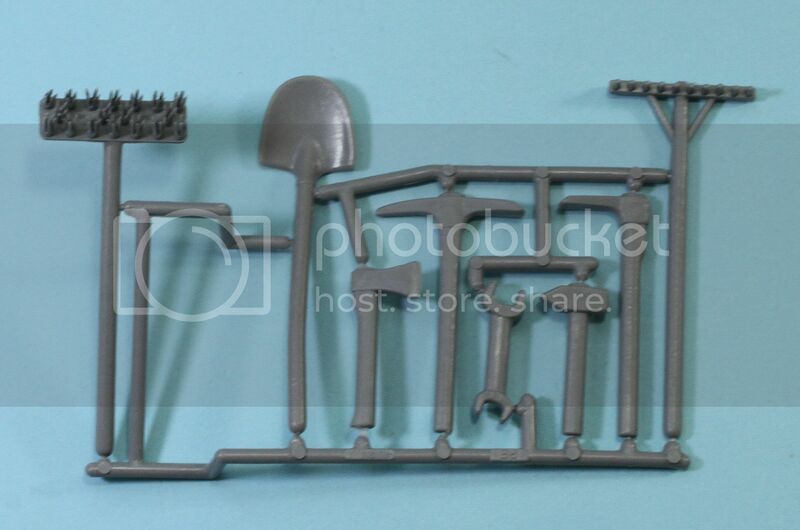 I'm pretty sure that's the same sprue and if so, the missing piece is a shovel! But that doesn't explain the strange kinks in the sprue! Turn the shovel face down so it is as in the packet. I reassembled my sprue with a shovel in the correct place and the correct way up (thanks playmofire!) (THAT was fiddly- you can see the glue in places!). 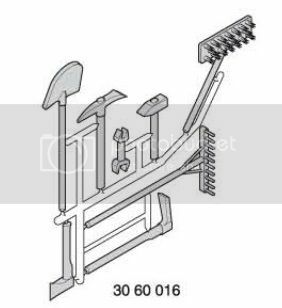 The configuration of the sprue seems to be to ensure the bristles of the push-broom point the same way as the tynes on the rake (its a bit distorted in the picture above), presumably so the moulded piece comes out of the mould easily. 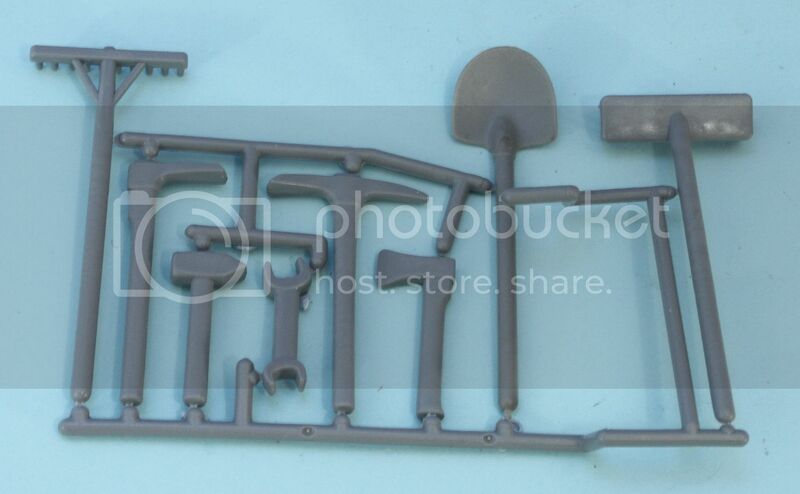 Another version of this sprue exists, e.g. in 7325 from 1999 below (using the same part number, of course! ), but I think my sprue is the earlier of the two versions as it was shown in that 1982-87 version of 3472. There may have been an even earlier version as this set of tools was included in the very first sets in 1974. Well done Graham (again!). I've added the sprue-pictures to my parts-page, and fixed the description which was truncated.